AlphaNinja: Am I taking crazy pills? I'm a west-coaster, so I wish someone in NYC could confirm this was a hoax. 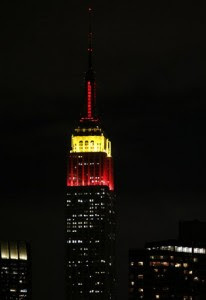 Did the Empire State Building actually light itself up with yellow and red yesterday, to celebrate 60 years of the communist regime in China that was responsible for 20-30million deaths in the "Cultural Revolution?" Seriously, it's a joke right?